There are many different housing arrangements that are appropriate for house rabbits. Some rabbits spend many hours each day in a cage, while others are rarely confined. Regardless of how much time your rabbit spends in his cage, it is important that your choice of housing be one that is right for both you and your pet. Your rabbit’s cage should NOT have four solid walls. Solid-walled cages do not allow enough ventilation for the rabbit. In addition, solid-walled cages do not allow the rabbit to feel a part of their surroundings. Size: The cage should be large enough to hold a litterbox, containers for food, water and hay, toys for your rabbit’s amusement, and yet still allow the rabbit to have room to stretch out comfortably. Remember, young rabbits WILL grow, so the size of the cage should be based on how large the rabbit will be as a full grown adult, not on how large they are at the time you purchase the cage. 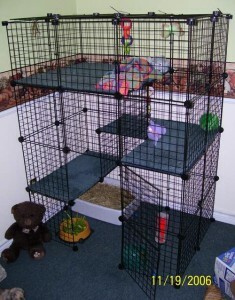 Consider not only length and width of the cage, but height as well. The rabbit should be able to sit up and stretch without hitting his head on the top of the cage. Some cages are two-story, or come with a built-in shelf or loft. This increases the useable space inside the cage and gives the rabbit the opportunity to jump and stretch. 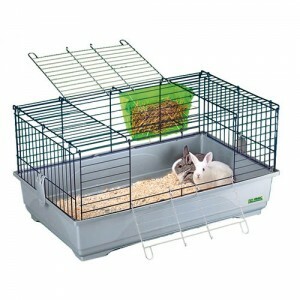 Doors: The cage should have a side door that the rabbit can easily hop through, unassisted, when you leave it unlatched. A side door should open to the side, not to the bottom, because the rabbit may get his foot caught in the cage door when entering or leaving the cage. There have been reported cases of rabbits breaking their legs on such doors. In addition to a side door, a top door may also be helpful for times when you need to reach in and remove the rabbit or clean the cage. Construction: It’s very important to inspect any wire or plastic on the cage for sharp, unfinished edges or corners that could hurt your bunny. Before you introduce your bunny to his new home, you will need to outfit his cage with a few accessories. Litter Box: Traditional cat litter boxes as well as plastic Rubbermaid type tubs, make excellent litter boxes. Of course, the size of your bunny should dictate the size of the litter box. If your rabbit likes to toss and flip his litter box, you can drill a hole through the lip of the box, and secure it to the side of the cage with a s-clip or ziptie. See our section on litter training for more information on litter and placement of the litter box in your rabbit’s cage. 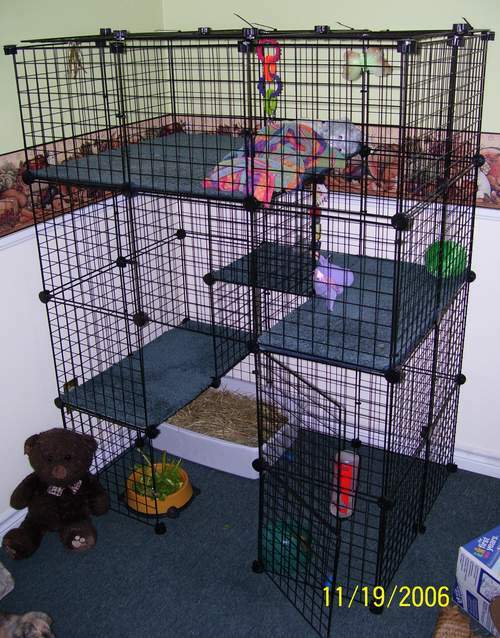 Cage Lining: If you are making a wire rabbit cage out of NIC panels, it is important to cover the floors with cardboard, carpeting or wood, you can also add towels or newspapers so that your rabbit has a comfortable place to rest. If you have a multi-level cage with wire-mesh ramps, the ramps should be covered with carpeting or another non-slippery material. If wire mesh ramps are not covered, your rabbit may get his toe nail caught in the wire causing a painful injury. Don’t choose a material that your rabbit will snack on (unless it is safe for chewing like cardboard or newspaper). If you find that your rabbit likes to chew, do not leave a towel or synthetic sheepskin in the cage with the bunny when you are not supervising. A bunny who loves to chew may chew holes in these items causing an impaction. Food, water and hay containers: For food and water, choose heavy ceramic crocks that can’t be chewed or easily dumped. You may also use plastic dishes, drilling a small hole in the rim to attach to the cage with a ziptie so bunny can’t flip them. For water, you may choose to use a water bottle. If do you use a water bottle, be sure to change the water and clean the bottle regularly. Also, note that some rabbits tend to drink more out of a bowl than out of a bottle. Your rabbit’s hay container could be anything from the end of the litterbox opposite to where the rabbit pees and poops, to a traditional hay hopper or a hay bin (such as a stackable Rubbermaid bin). Be creative. You may have to experiment with different types of hay containers before finding the right one for you. NIC cages are cost-efficient compared to other large rabbit cages. Versatile and easy to assemble. NIC cages can be any shape or size. 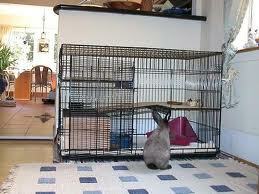 it should extend to the walls of the cage so the rabbit will be less likely to find a corner to chew on. Using chloroplast (corrugated plastic available at hardware stores) as a base to your cage provides a waterproof barrier between the cage and the floor preventing spills from seeping into the floor or carpet. The chloroplast can then be covered with a non-slip surfeace such as cardboard or carpet. These cages can be messy, unless you build (chloroplast) or buy a guard for around the bottom of the cage. 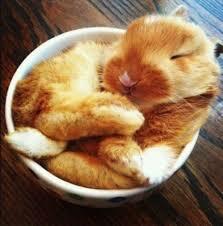 If a bunny is prone to tipping their water dish, water may spill out on the floor. Easy to clean the floor of the cage. If the rabbit is not litter trained they could develop urine burn from sitting in urine. Most plastic bottom cages have high solid walls that can limit smaller breeds from seeing their surroundings. Most only have doors on the top so the rabbit always needs to be lifted in and out of their cage. can simply be rolled up and tossed away. Kennels collapse flat for easy storage when not in use. New dog kennels can be costly. Stainless steel tray bottoms may be too slippery and have to be covered, so that the rabbit does not develop splay leg. around the bottom of these cages if used for babies or small breeds. If you just can’t find that perfect cage, you can construct a cage or pen to meet your rabbits needs. Some rabbits like to chew so a cage constructed with a wooden frame could easily be demolished. Never make a cage using chicken wire, rabbits can chew through this thin wire and cut their mouths. are the most important factors to consider. There are so many different options for housing your rabbit. Regardless of which you choose, it is important to remember that the area should feel like the rabbit’s home. 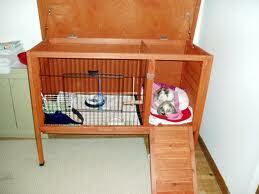 To help your rabbit settle in, start by setting up the cage in a room where the rabbit can exercise. The rabbit will soon learn that the cage is the place to go for food, water and the litter box. Soon enough, you will find that your rabbit has accepted the cage as his personal space. However, if the cage is set up poorly, or is too small, your rabbit will see the cage as a place of confinement, rather than as a place to call home.